Contact Improvisation is an open exploration and a multi-dimensional practice relative to physical play with gravity, release of the tissues to initiate a certain quality of movement, fluidity/articulation into communication and human relationships, emotional connection, collective intelligence… It develops the ability to listen and act from sensing, self-responsibility about our limits with safety and intimacy (how we are able to take care of our integrity, especially when we are challenge by others). This workshop will be an immersion into the fundamental principles of CI, it’s accessible and open to anyone. Previous experience is welcome, but not necessary to enjoy participating in the workshop. Karthik Rajmohan: I am a performance artist and teacher/facilitator mainly working with contact improvisation, physical theatre and contemporary dance. I am interested in exploring physics and body mechanics through dance/movement methods and somatic practises. I have trained in various forms but my interest is not in the forms or methods but rather to use them as a tool to enhance ones perception of the body and its layers/dimensions. I love to create a space to explore and play with this intelligence. Elise Malafosse: my interest for the body started at University through linguistic, gestural semiotic and non verbal communication studies, then I have been practiced and trained Yoga (Intégral, Ashtanga Vinyasa, Yogatherapy) and Massage (Tuina, Ayurveda) for 10 years. 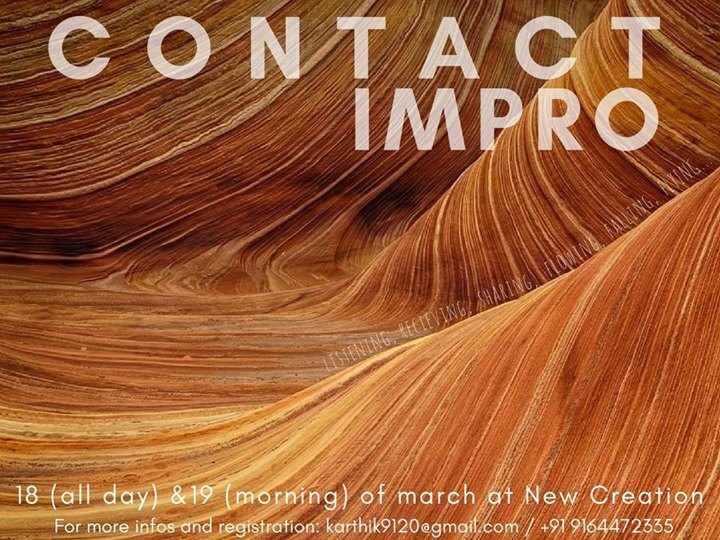 And the last 4 years, Contact Impro dance and the somatic practices (BMC, Axis Syllabus, Playfight, Rolfing) continue to nourrish deeply my exploration of movement and being. Firstly practitioner, researcher and player, transmission cross my road at the mercy of desires, meetings and invitations.